Download funny animals cartoons for free! Free business cartoons (finance, insurance, industry) for your presentations, e-mails and newsletters! 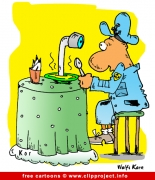 Funny cartoons and comic strips by cartoonist Wolfi Korn. Jokes about cars and automotive business. Cartoons for office. Have a fun sending these cartoons via e-mail to your colleagues! Children cartoons, baby cartoons, funny jokes about children! Funny jokes and cartoons about the most beautiful holidays Christmas and New Year! Free comic strips for several topics like sport, love, cars, animals and more. Funny family cartoons for free: marriage cartoon images, married cartoon pictures, family jokes! Free football / soccer cartoons for football world cup and euro cup. Funny jokes about this popular sport! Funny medicine cartoons about doctors, patients! Medicine jokes! Funny military cartoon images directly from army! Funny cartoon pictures, comics and jokes about crazy parties! For school boys, girls, teachers and profs funny school cartoons! Download free sport cartoons for every issue: Olympic Games, marathon, school sport events etc.